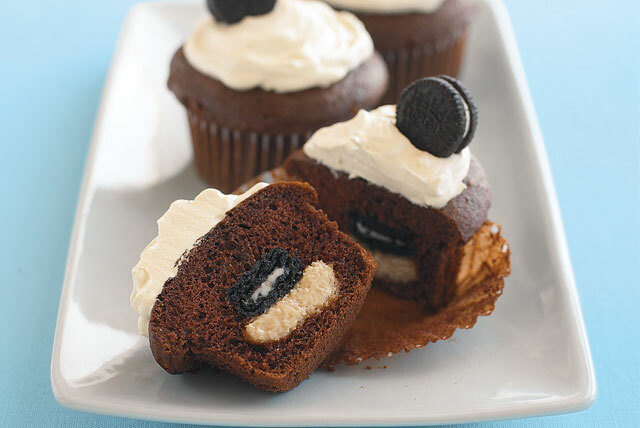 Your kids will get a kick out of these cupcakes with a cookie treat that bakes inside. 1. PREHEAT oven to 350°F. Prepare cake batter in large mixing bowl as directed on package; set aside. 2. WHISK cream cheese, egg and sugar in small mixing bowl until well blended. 3. SCOOP cake batter, using 1/4-cup dry measuring cup, into each of 24 paper or foil-lined medium muffin cups, filling each cup about half full. 4. SPOON 1/2 Tbsp. of cream cheese mixture over batter in each muffin cup. Top with 1 cookie. Cover evenly with remaining cake batter. 5. BAKE 19 to 22 minutes or until toothpick inserted in center comes out clean. Cool 5 minutes; remove from pans to wire racks. Cool completely. 6. TOP cupcakes with whipped topping and remaining cookies just before serving. Makes 24 servings.